For a new early music/period instrument ensemble to make it in this area, it has to cut a distinctive profile. Eudaimonia has burst on the scene with its goal of presenting each concert “in support of an existing Boston-based social service or initiative.” Its initial concert on Sunday at the Medford Unitarian Universalist Church also disclosed real artistry. 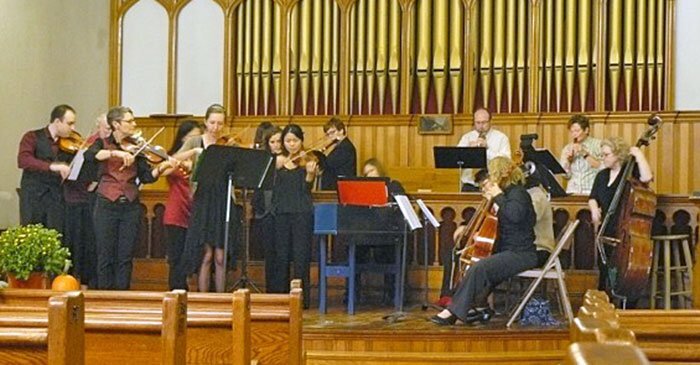 Led by Julia McKenzie (violin) and Vivian Montgomery (harpsichord), Eudaimonia partnered with the organization Shelter Music Boston and featured that organization’s director, Julie Leven, as soloist in Vivaldi’s “Autumn” from The Four Seasons. Shelter Music Boston brings performances to spaces where homeless people live. Julie Leven pointed out that homeless people usually cannot attend evening concerts, even if admission is free, since shelters require that they be present to participate in the lottery for the available beds. Much of the program was sculpted to address issues of homelessness: moving poems written by homeless women were interspersed between the music selections. The concert’s title “Autumn’s Grace” invoked the beauty of the season, but also the need and fear it can suggest to homeless people facing the portent of winter. Montgomery pointed out that some of the musical selections they chose included structural elements such as a ground bass or Chaconne, which can serve as a metaphor for the foundation of a home; the repeating elements offer security, and a base from which to carry out creative endeavors and expressions. My one quibble is that the publicity for this event didn’t really give a very good picture of what to expect, either in terms of performing forces, or the range of music included on the program. What Eudaimonia billed as a “period band” was, in fact, an orchestra of six violins, three violas, three cellos, string bass, two flutes, recorder, harpsichord, and more (discussed below). The instruments filled the stage/altar of the church, which was a lovely (with beautiful woodwork), comfortable space (those UUs pad their pews). The ubiquity of Vivaldi’s “Autumn” had me not looking forward to it, but it was completely delightful. I knew about the sonnets (probably by Vivaldi) associated with the Four Seasons, but I had never paid attention to the one for autumn. Soloist Julie Leven pointed out (before playing) the aspects of the poem that we would hear in the music—the drunken motions of the celebrating peasants, and the lilting breezes as they peacefully doze. Then the bold vigor of the hunting party, the horn call exchanges (between violin and cello), the frenetic, desperate energy of the quarry, and the brisk sounds of gunshots (string accents). It was all done with great vitality (in an arrangement by Julia McKenzie) and it certainly gave new meaning to a piece I thought I knew. Next came a premiere by John Howell Morrison (and just to clarify some of the connections here, Morrison and Montgomery are married, and Montgomery and I are colleagues at the Brandeis University’s Women’s Studies Research Center ). Morrison offered a compelling interpretation of the wistful poem “September” by Jennifer Michael Hecht, which begins “Tonight there must be people who are getting what they want/ I let my oars fall into the water…” Soprano Pamela Murray conveyed the text with clarity and understated poignancy; mezzo Carrie Cheron joined to give resonance (the two blend perfectly) to section endings. Morrison achieved transparent liquidity in the floating string chords and gentle motion of cascading arpeggios in the flute and recorder. The calm mood is given an edgy restlessness by occasional dissonances and some gently jarring abutments of major and minor, but the overall feeling of atmospheric melancholy prevailed. The audience held its breath at the end, not wanting to disturb the tranquil spell. The remainder of the program was a surprise in its breadth and variety; there were three works of the Chaconne/Passacaglia type, by Elisabeth Jacquet de la Guerre, Purcell and Marin Marais. These featured chamber subsets of the full ensemble. Also from Vivaldi came sections from the oratorio Juditha Triumphans, which was written for the girls and young women at the Ospedale della Pietà, the orphanage for which Vivaldi worked many years. We heard an aria sung by Judith (Cheron) to her handmaiden, asking for her devotion and in turn pledging her own, as they gear up to undertaking the daunting task of beheading Holofernes. The lyrics invoke the turtledove, as a symbol of devotion, and Vivaldi paired a chalumeau with the singer to illustrate that faithful bird. Single-reed polymath Diane Heffner (she performs on historic and modern clarinets of all sizes, as well as jazz sax) demonstrated her expertise on the chalumeau—now there’s something you don’t get to hear every day! Although the size of a soprano recorder, its range is the central register of its descendant, the clarinet. Its distinctive, nuanced, plaintive timbre was quite memorable, and I was happy to hear this bit of organological history be brought to life. Cheron and Heffner harmonized sensitively and liltingly over the undulating strings. Then followed a chorus, with the women of the ensemble joining Cheron and Murray in singing a prayer to the God of the Jewish people. My admiration for instrumentalists who are also excellent singers has come up a few times in my reviewing lately! After several parts of Handel’s Judas Maccabeus, the event concluded with some lively selections from Telemann’s Overture Burlesque. Beautifully planned, the proceedings balanced aesthetic pleasure with reflection on the problem of homelessness. One little logistical flaw must have caused the organizers a real “D’OH! !” moment: planning a concert? in downtown Medford? Next time you’ll think to check whether the city might be having a major parade (including 19 bands) celebrating the town’s founding, marching right past the venue. Though the start time of the concert was moved back a half hour, there was still some overlap, but the Ivesian moments did not greatly detract from the intended affect. Eudaimonia’s next concert will take place in the spring, their website is here.